Normally, People Will Use SSH to Edit the Nginx Configuration Files. 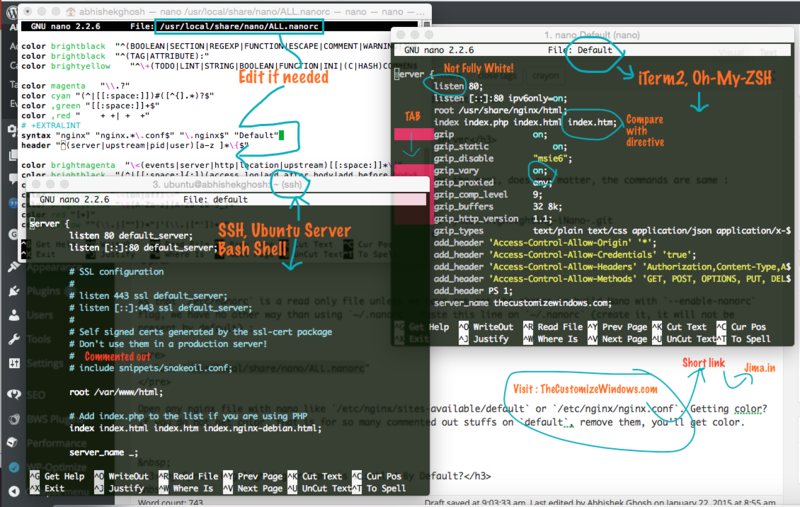 Here is How to Get Nginx Config Syntax Highlighting in Nano on Ubuntu. First, we are describing the method for localhost, so that one can test and edit the rc files, in other two subheads, we will describe how to enable Nginx config Syntax Highlighting in Nano on Ubuntu Server and what are problems of Syntax Highlighting in Nano. By any means, DO NOT MAKE NANO THE DEFAULT TEXT EDITOR. Using Vi is not so difficult – open the file with command like vi /etc/nginx/nginx.conf and press i to edit. Edit it and press escape. Then type :w to write out and :q to exit. You will get Syntax highlighting more than default. This is my current repo on GitHub for Nanorc. Star the repo, I will update it. When I will update, you’ll also update again. Test any file on your computer including Nginx Files. Without the flag, adding the line on /etc/nanorc, will not work. Open any nginx file with nano like /etc/nginx/sites-available/default or /etc/nginx/nginx.conf. Getting color? If you do not get color, that is for so many commented out stuffs on default, remove them, you’ll get color. Why Syntax Highlighting in Nano is Disabled By Default? If you know more .nanorc, you can send a pull request to add. We use .zshrc on all my Macs, MacBooks with export PATH=/usr/local/bin:$PATH on both .zshrc and .bash_profile. As Nano is not the system default text editor, unlike vi, there is no fear, you can build the latest version. Our .bash_profile has that only one line. There is no .bashrc. It is impractical to comment out so many includes on the fly. When nano will throw segmentation error, then the way is to use vi to open it with sudo vi ~/.nanorc in Terminal (not iTerm2) and commenting out that line to solve the segmentation error. So much is not said, only people says – “Vi is powerful editor”. Powerful means, it will not throw abnormal errors. Chance of error increases if you use Syntax Highlighting in Nano. This Article Has Been Shared 5631 Times! Cite this article as: Abhishek Ghosh, "Nginx Config Syntax Highlighting in Nano (Ubuntu)," in The Customize Windows, January 22, 2015, April 21, 2019, https://thecustomizewindows.com/2015/01/nginx-config-syntax-highlighting-nano-ubuntu/.